Other names: Bua tampoi, luk pui. Lang-khae is a native of South Thailand and Malaysia. It can be seen growing in Peninsular Malaysia, Singapore, Borneo, and Sumatra. It is also sometimes planted in home gardens in these areas. A medium sized tree up to 25 m tall. Leaves elliptic-oblong, and about 25 cm long and 10 cm broad. Flowers borne on the main stem and big branches in spike-like panicles which are slender and 8 cm long, occurring solitary or fascicled on the branches; fruiting racemes are short bearing 5-6 fruits in each panicle. The fruit is eaten fresh. It tastes sweet with a tinge of sourness. 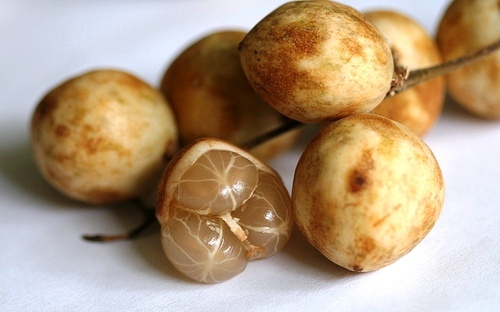 It is quite popular with local people and during lang-khae fruits can be seen in supermarkets of big cities in Thailand as well as in local markets in smaller towns, especially ion Thailand. Lang-khae mostly used to be propagated by seed earlier. As the seedlings more male trees, so the growers these days prefer to multiply this fruit by vegetative means. Budding and grafting on seedlings are the preferred methods and both are equally suitable. The asexually propagated trees come into bearing in 4-5 trees. The seedlings take atleast seven years for coming into bearing. This fruit tree has a good future not only in Thailand, but in other tropical regions too. The demand for this fruit is increasing. It is a good yielder. 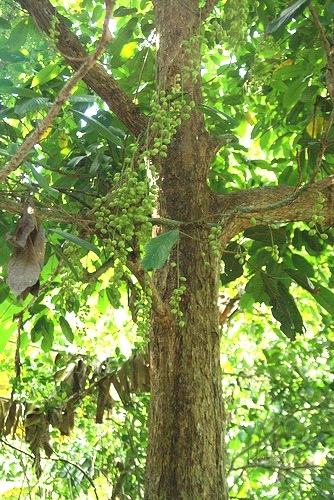 A single lang khae tree can bear upto 300 kg of fruits. Therefore it can be a source of income for the farmers. Lang khae should therefore be promoted as a new crop.